The first things you notice about the new Mogul Earpollution DJ Style headphones from iFrogz are the sleek, stylish design and color scheme. These headphones are clearly meant not only to deliver great sound quality, but also to turn heads of people around you. They are portable and fold in half for easy storage. If you are annoyed with how some headphones have twenty foot cables, you will appreciate the Mogul’s 5-footer. The large, flat, padded style of the headphones fully covers your ear and slightly conforms to the shape of your ear to deliver better sound quality and comfort. One downside to the design is that on higher volume levels, anyone within 20 or 30 feet can hear your music. Although this doesn’t matter if you are out at a loud club as a DJ, many consumers want to keep their music to themselves. Additionally, if you are using these headphones on a phone such as the iPhone, you HAVE to turn the volume to at least 80% in order to hear your music well. This sounds extreme and head-bursting for most people, but unfortunately the Mogul headphones are extremely quiet when used on portable devices, and almost inaudible for any volume less than 50%. These Earpollution headphones appear to be rather durable, though no more so than most in this price range, due to the large amount of plastic. They do lack popular features you see on other DJ-style headphones, i.e. no on-cable volume adjustment or individual headphone volume. However, the headphones do swivel 90 degrees which allows for comfort when hanging them around your neck. 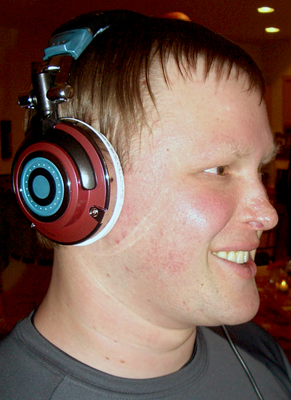 If you look on the side of the headphones, you will notice small black print stating “DJ STYLE: SUPER BASS.” Unlike most headphones that claim exceptional bass but don’t pull through, these Earpollutions deliver. After testing Mogul with various styles of music, the most impressive genres are techno and hip-hop, though music sounds great across the board. They are able to capture even the lowest decibels on any popular song, while not overpowering you with bass so loud your heart rhythm changes to match the beat. The mid and high-level ranges are crisp despite Mogul’s heavy focus on bass. The iFrogz Mogul Earpollution DJ Style headphones are great for anyone wanting to DJ at a club, or simply listen to music on their computer. If you are out on the go using a handheld device, you may find the sound leakage, inability to separate headphone volume from device volume, and lack of audible sound unless the volume is cranked as downsides, depending on your preferences. That said, the sound quality is exceptional. I have yet to make the sound pop or become static at even the highest volumes, something that some high-end headphones can’t pull off. If you are looking for style and great sound quality that fits any budget, look no further than the Mogul DJ style headphones.